Prime Minister Dr Mahathir Mohamad has conceded that Pakatan Harapan's manifesto for the 14th general election is akin to an albatross around the coalition's neck. 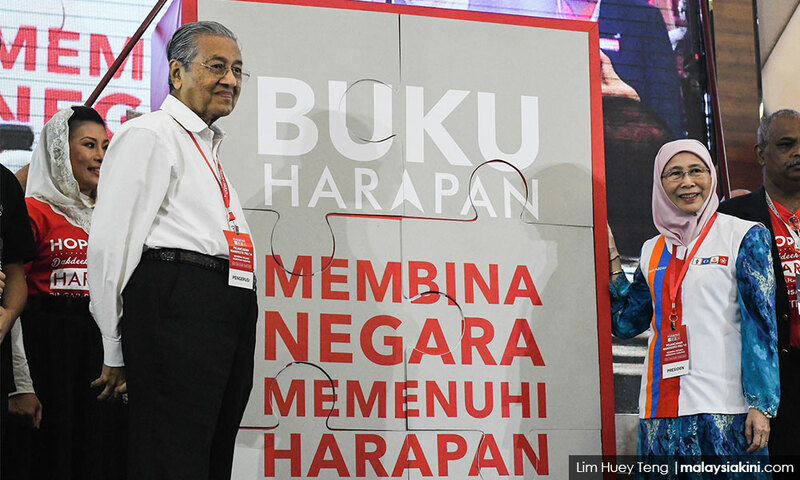 He said this is because the 195-page document, which promised to implement 60 promises over the next five years and 10 in the first 100 days, was drafted when Harapan did not imagine forming the federal government. “We made the manifesto thinking we would not be the government. “Now we are the government and this manifesto is a big burden,” he told an interview with RTM and Bernama. Mahathir also claimed that he was opposed to the abolition of tolls, which was included in the manifesto. The premier said scrapping tolls on highways was not possible. A month before the May 9 general election, Mahathir, who is also Harapan's chairperson, was reported as stating that if the coalition forms the government, it would end toll charges nationwide in stages instead of doing it in one fell swoop. “Toll charges will be abolished according to the contract with concessionaires,” he had said. In July, Works Minister Baru Bian asked the people to be patient over Harapan’s promise to abolish toll collection. “What we have promised, we will have to do it,” he had said, adding that the matter cannot be rushed as there were various issues which must be considered.